We love 2-for-1 devices here at Inhabitat – after all, what’s more efficient and environmentally friendly than having one single tool that can serve variety of purposes? That’s why we were super excited today at the Consumer Electronics Show to discover the Freeplay Companion: a solar and hand-cranked mobile power charger that also happens to be a radio and a flashlight all in one cute little package. Measuring just 4.9″ long, this veritable Swiss Army Knife of renewable power generation can charge cell phones with either solar power or physical exertion (hand-cranking), as well as helping you out with your radio and lighting needs. Seems like it would be a perfect thing to have in case of an emergency, (or emergency camping trip) but also extremely handy just to have kicking around the house as well. Offering a choice of self-charge, solar and external recharge power options, the Companion delivers complete independence from wall power or disposable batteries while ensuring environmentally sustainable access to information and entertainment. A 1-minute wind gives you 20 minutes of radio listening at normal volume, or 30 minutes of light, and you can wind some more at any time for as much play time / shine time as you want. Designed as a companion for those who value independence from conventional power sources, the Companion was just announced and will be in retail for $30 in stores like REI by the spring. With a long history of selling hand-crank radios and lights, Freeplay’s stated mission is “To make energy available to everybody all of the time”. As one would expect from the universal practicality of their products the company is heavily involved in aid and development work around the world, in addition to simply stocking outdoorsman stores with cool off-grid gadgets. In fact the whole company was founded on a simple humanitarian design idea. While watching a BBC documentary on “The Clockwork Radio” in 1994, Freeplay founder Chris Staines first realized the importance of energy independence and sustainable mobile energy generation. In Africa many people listen to the radio for communication, education and entertainment. 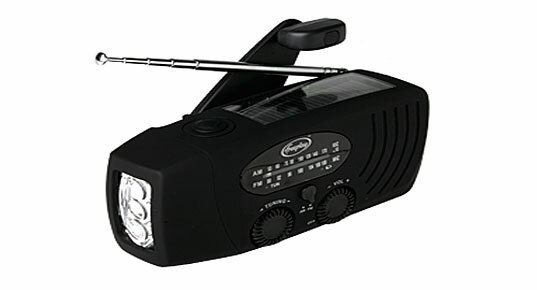 While traditional radio is widespread, it relies on an electrical supply or the availability of disposable batteries – both of which were in short supply across the continent. Chris and his business partner, Rory Stear, immediately realized that the potential for self-sufficient electronics could go much further than radio and Africa. Thus the “self-sufficient electronics industry”, and the Freeplay Energy Group were born. But its not just Africans who need freedom from disposable batteries and nasty electrical cords. In the future every gadget should be renewably powered through kinetic and solar energy. Freeplay is lighting the way for all of us. I've got a few Freeplay devices and they are by far the best of the pack in terms of hand-powered radio & lighting. There are cheaper ones out there but "you takes your chances." One of the most useful is the Indigo room lantern. This has a cluster of LEDs with a brightness control and will run for a couple of hours at the high setting (which lights up a room nicely) or a couple of days at the lowest "night-light" setting, which is quite sufficient to find one's way around in a dark room at night. There is also a separate switch for a reading light that is a single large LED focused downward and is indeed strong enough to read by. Comes with an AC mains charger that uses so little power it doesn't even register on the Kill-a-Watt plug in power meter. Available at REI for about $40 and worth it. This is indeed a nice machine but I wonder if it also charges standard size batteries, AA for instance. That would make it even more versatile. I've had a solar/dynamo flashlight/radio that was modified to charge AA batteries since before Y2K. I use it as my bedside radio and once even thought about getting it manufactured before deciding I wasn't really a businessman. You can see video of the device, including a schematic of the wiring modifications, at http://solarray.blogspot.com/2006/03/solar-video.html Videos of some of my other solar prototypes and experiments are at http://www.youtube.com/gmoke In fact, solar/dynamo radios were dropped into Afghanistan by US forces before the invasion and NATO continues the practice with a model that even includes a small LED light. These solar/dynamos don't charge removable AA batteries, just the internal hard-wired battery, according to my best information. They could be modified to do so and I've tried for over a year to contact someone in NATO, Afghanistan, or Washington who might be interested in the idea. No luck. The solar/dynamo could fit into what I call a solar swadeshi, see http://solarray.blogspot.com/2005/05/solar-swadeshi-hand-made-electricity.html for more, especially if such an initiative was linked to the memories and traditions of the Pashtun Gandhi, Badshah Khan. Solar IS Civil Defense - a solar/dynamo to power the light, radio or cell phone, and extra set of batteries you are supposed to have on hand in case of emergency. With a solar/dynamo you have access to power day or night, but sunlight or muscle power as long as the sun shines, you have the strength to turn the crank, and the batteries can hold a charge. We love 2-for-1 devices here at Inhabitat - after all, what's more efficient and environmentally friendly than having one single tool that can serve variety of purposes? That's why we were super excited today at the Consumer Electronics Show to discover the Freeplay Companion: a solar and hand-cranked mobile power charger that also happens to be a radio and a flashlight all in one cute little package. Measuring just 4.9" long, this veritable Swiss Army Knife of renewable power generation can charge cell phones with either solar power or physical exertion (hand-cranking), as well as helping you out with your radio and lighting needs.